It should be noted that this movement is not new. 10 years ago Tarana Burke coined the phrase and she is credited for creating the campaign that lets women, specifically women of colour, know they are not alone when they have experienced sexual assault. After Milano tweeted the phrase, women, female-bodied, feminie identifying people and men responded en masse to the call out—many boldly sharing their stories of sexual harassment and assault for the first time. It has signalled a shift in our culture, creating awareness around the prevalence of sexual assault (physically, verbally and emotionally) that many men were in the dark about for so long. Why? Well, that’s a difficult question to answer. The people who have responded to #MeToo experience this injustice as a regular occurrence. And in Australia, one in four females have experienced physical or sexual violence by an intimate partner. To say this is widespread is an understatement. While the global response of #MeToo has been gigantic, it still doesn’t reveal the full extent of this global inequality. Many people have chosen not to share their #MeToo and others have disengaged to protect their health due to the trauma of their own experiences. So where does that leave us? Or, more pointedly—where does that leave you? 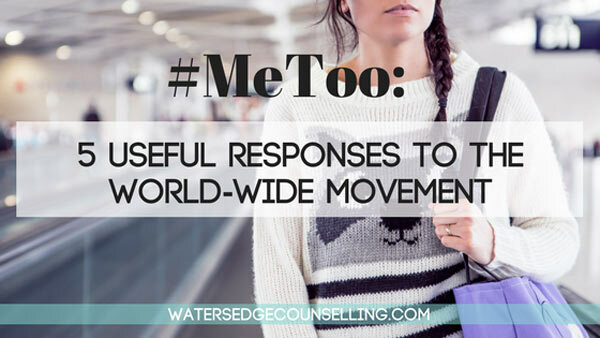 The Watersedge team could write our own response to #MeToo. Each of us have experienced or heard about the reality of sexual violence and assault in different contexts: as ministers, celebrants, therapists and counsellors, social workers, friends, husband and wife, daughter, son, friend, mentor and as a victim. Due to this, we know that every women, female-bodied or feminine identifying person has their own #MeToo (not to the exclusion of some males). So instead of sharing our own stories with you, we want to share some of the important responses to the movement. We hope that you will read these and gain a fuller understanding of the movement. If you can say “me too,” we hope you know you are not alone. We believe you. We see you. If you have chosen not to share your story, you don’t owe this experience to anyone. Take care of your health and know that we believe you. If you are a man who has realised they are a perpetrator—intentionally or due to cultural norms that have influenced your values or behaviour, this is your time to stand up, change your behaviour and say #ItWasMe. And if you are a man who is outraged and saddened by the existence of even one #MeToo story and call yourself a feminist or someone who values equality, then you must speak up. Silence makes us complicit, even when we don’t take part.